HP has been in technology news for all the wrong reasons lately, what with the on-again, off-again discontinuation of the TouchPad. But despite all the turmoil within HP, its 12c Financial Calculator is celebrating its 30th birthday. To commemorate this milestone, the company has released a special edition version of the calculator. As the name suggests, this calculator would probably not be particularly useful in a math test. This calculator is made for financial number crunching as opposed to solving standard mathematical equations. In fact, after 30 years, the device is not only still used through the financial sector and in Chartered Financial Analyst exams, but also still readily available to buy. According to Dennis, the then-project manager for the 12c, the calculator had a few useful traits that preserved its longevity. It has a sturdy design, and the batteries seldom need changing thanks to its power-saving technologies (which were quite something when it was first released in the 80s). While it may be just another calculator to many, HP's 12c is still industry standard, and after 30 years of work, it deserves a slight retouching. 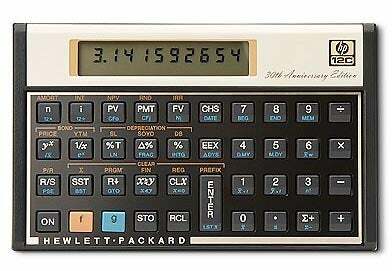 You can pick up one on the very limited edition calculators for $80 on HP's special anniversary page, and see HP's TheNextBench blog (written by none other than former PCWorld editor Darren Gladstone) for more background. Did you ever buy or use a 12c calculator for work? Tell us your experience in the comments below!